This intriguing faux charcoal drawing is actually a piece of digital art. 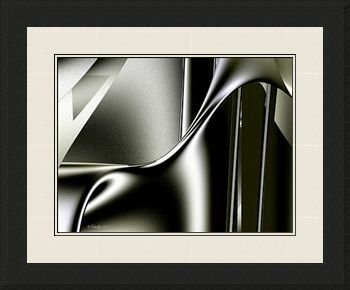 Similar to my other artwork (but not tinted) titled 'Sinuosity #1', the softly yielding curves of the main features, with their diagonal movement and smooth radiant sheen, are offset and complimented by horizontals and diagonals and a background with a rougher textured surface. This unique composition is appealing and unusual. The luscious flow is sensual, seductive and imaginative. The 2.5' frame, 'Magnificent Matte Black', has a wide flat surface which steps down to a three quarter inch slope on the outer edge. Creating art is - for me - a true give and take between what I attempt to do and what the evolving piece makes me do. Often, when I try to push the art in one direction, it responds differently and makes me take it in another. The art itself surprises me, and it directs me into the area it wants to be taken, rather than accepting what I try to make it do. And so I let myself go and the art takes over and the evolution excites, surprises and amazes me. I love it!